You’re probably aware that you can ask Siri for directions, and the personal assistant will route them for you through Apple Maps. This is an excellent feature to use while driving as it keeps you focused, and prevents you from poking around on the screen too much, which also happens to be an increasingly ticketable offense in some areas. But what if you’d rather use Google Maps for your directions? While there’s no direct Siri command do this, with the addition of a simple verbal trick for a standard directions request you can have Siri serve your route through Google rather than Apple Maps, and it’s super simple to use. Before beginning, you will need to have downloaded Google Maps for iPhone (App Store link) if you haven’t done so yet, it’s free and a great additional mapping app to have on the iPhone post-iOS 6 anyway. You can say either “via transit” or “using transit”, pick whichever works best for you and how Siri interprets your voice and accent. The App Store will also give options to route through Waze and other maps apps if you have them installed, but Google Maps is what we’re looking for here. 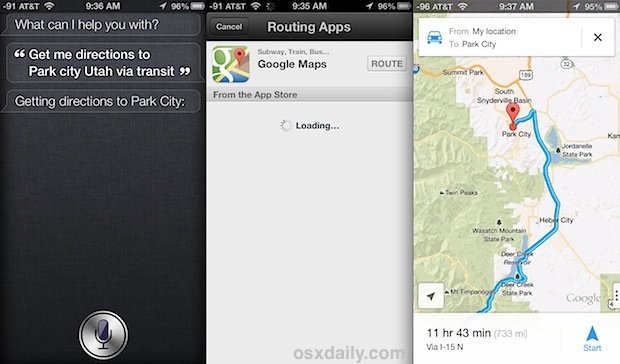 This will cause Siri to pull up the App Store briefly, and if you have Google Maps installed, you will see that icon with a “Route” button which then sends the directions through Google Maps rather than Apple Maps. Don’t expect this feature to be around forever because sooner or later Apple Maps and Siri will likely offer transit and walking directions itself, thus removing the need for it to reroute through additional apps, but in the meantime it works. Ideally, we’d have the option from Siri to set a default Maps app (and other default apps for that matter), but that seems fairly unlikely. 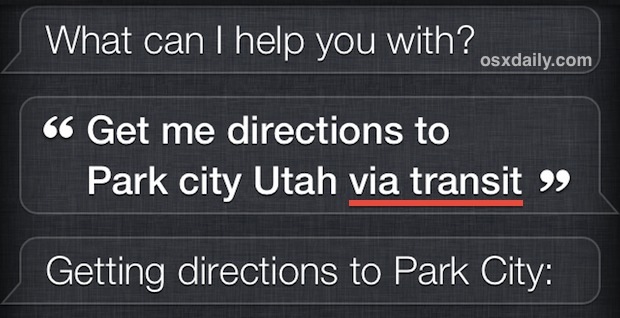 Thanks for the tip and for using Park City, UT in the directions. You don’t have permission to access “http://fbexternal-a.akamaihd.net/embed/?” on this server. Reference #18.5efa4317.1362677258.95db31a i keep getting this message when im on facebook on my Ipad. Help!